Experience a movie like never before. The Premier movie package includes everything needed to present your audience with an incredible experience they won’t soon forget. The screen is perfect for 100 to 300 guests with HD quality video, and a sound system to match. Prices starting at $459* including delivery! 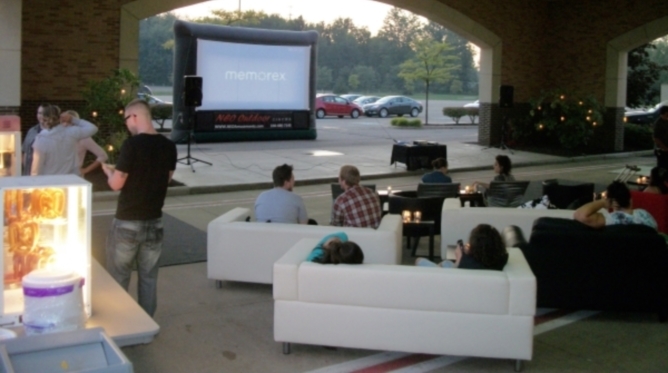 NEO Outdoor Cinema provides 16′ tall screen with an 16′ x 9′ viewing area. 1100 watt sound system for great movie quality sound for hundreds of guests. 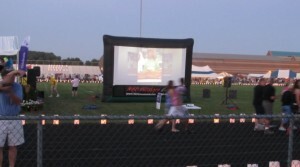 5000 lumen projector, DVD or Blue Ray player, table, cables, and any other necessary equipment. Our event staff will deliver, setup, and test the equipment. An event host will stay and run the event for you. No need to do anything. Just show us where you want the screen and we handle the rest. *Additional delivery charges apply for deliveries more than 15 miles from our warehouse in Cuyahoga Falls, OH. Charges will be calculated automatically when you fill out the quote request form.